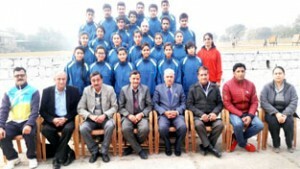 JAMMU, Jan 1: The 24-member J&K Fencing team, including 12 boys and equal number of girls was cleared by the Screening Committee of J&K State Sports Council and selected to represent the State in the Junior National Fencing Championship to be held at Billaspur in Chattisgarh from January 7 to January 10, 2016. The Screening Committee included Shiv Kumar Sharma, Joint Secretary J&K State Sports Council, Arjun Awardee Krupali Singh, International Fencer Rashid Ahmed, Sports Promoter Arjun Choudhary and Divisional Sports Officer Rajan Sharma. Earlier, 21 days coaching camp sponsored by J&K State Sports Council was held to hone the skill of the fencers. The team: Ravi Sharma, Pankaj Kumar Sharma, Teja Singh, Shubham Sharma, Javed Ahmed, Vansh Mahajan, Karun Bakshi, Abdul Rafiq, Tariq Hussain, Parth Jamwal, Ranvijay Singh, Dhruva Gupta, Anchal Gupta, Kayal Kumari, Deeksha Pandey, Shriya Sudan, Rupali Sharma, Sindhiya Sharma, Arushi Sharma, Akanksha Sabharwal, Shipla Lalotra, Mokshi Sharma, Jaspreet Kaur and Priya Khajuria. The team will depart for the venue on January 4, 2016 and Shotu Lal Sharma will be accompanying the team as coach, Amit as manager boys and Ekta as manager girls.